It’s been almost eight months since I first acquired a Pebble Smartwatch. So, after all this time what do I think of the watch? It’s very good at providing it’s basic, out-of-the box features. My experience seems to have been better than some. Others have had more issues with firmware updates, reliability, and connectivity. I’ve experienced some of these problems myself though I was able to overcome them. Initially, I had more issues with connectivity. For a while it would refuse to connect to the phone about once every two weeks and the process required restarting both the phone and the watch (and sometimes resetting configuration settings) to get it working properly. Over the past few months those problems have nearly dropped to zero. Yet, I have elected to not take full advantage of the additional features available via the installation of apps. The few times I’ve tried them I’ve noted an increase in problems with both connectivity and stability. Early on I simply chose to avoid them and I suspect that’s the main reason that I’ve experienced fewer issues. For the most part, I’m only interested in the clock, a few custom watch faces, and the notifications. I’m a geek. I like to use and experiment with gadgets. I also have a need to be aware of any phone calls, texts, etc as soon as they’re received by my work phone. If you’re not a tech geek, and you don’t need to know the instant someone tries to reach you via the phone, then I can’t really say that this is a ‘must have’ gadget for you. Sure, smartwatches are useful, but I’m not buying all of the hype about the long list of features promised by various smartwatch manufactures. I still prefer devices that have only a handful of features, but execute those features elegantly and reliably. There are more feature-rich smartwatches available but they’ve stumbled out of the gate in a hurried effort to catch up to companies like Pebble and others. I prefer the simplicity of the Pebble. It works well for me because it uses a simple black and white e-ink display. It’s less distracting and doesn’t require a lot of power to run. I was able to swap the band with a standard 22 mm leather band (who wants to take bets on whether or not Apple will offer this level of compatibility versus charging a premium for colored bands?). It’s waterproof and doesn’t scratch too easily. I think it’s futile for any smartwatch manufacturer to try to replicate most of the features on a phone if this still means that one must carry a phone around. Sure, a watch that can replace a smartphone might be useful for some people, but if I still have to use my phone then I’m just not interested in having hundreds of features and apps on my watch. I’m interested in the practical applications such as notifications (with vibration), display of caller-ID, a clock, and simple music control. Beyond that I just don’t really care. Many of the other smartwatches are fraught with problems. Even Pebble has its own issues. We’re currently in the first generation of smartwatches. Undoubtedly, the next generation will feature longer battery life and smaller profiles. 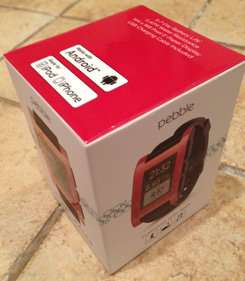 The Pebble isn’t huge compared to some of it’s competitors, but it’s still bulky. I suppose it’s possible that Apple may push the smartwatch industry to a higher standard. It’s hard to say. I’ll be interested to see if the ‘iWatch’ only supports iOS. If so, I don’t think Apple will be able to corner this market easily, if at all. It’s one thing to sell people a specific phone but it will be much harder to convince people to swap phones simply to use a specific smartwatch. But I find it hard to imagine Apple marketing it as just a smartwatch – I would be more inclined to see it take the form of an iPod that looks like a watch (cue the launch of Beats Bluetooth Apple Earbuds). Apple could have already done this a couple of years ago with a previous iPod nano form factor. Some third-party manufactures actually sold wristbands that would hold an iPod nano (6th Gen) so it could be worn as a watch. I suspect there are a few Apple executives kicking themselves for having missed this (I actually looked at purchasing this type of nano to use as a watch at one time but decided it wasn’t worth it). Some of the more basic features of the Pebble should be supported by any smartwatch to be truly successful: simple watchband replacement, long battery life, and waterproof. If you expect people to pay a lot of money for a device that will live on their wrists then it needs to be waterproof (water resistant just isn’t good enough). Is a smartwatch something that everyone will be wearing in the next few years? Eh, I’m not sure about that. That will be driven by price and battery life more than anything else. I don’t mind charging mine once a week, but many will probably take theirs off to charge at some point and simply never bother to wear them again. And it will be a more difficult sell to convince consumers to spend at least a couple of hundred dollars more to wear a smartwatch that does nothing more than replicate some of the features that any smartphone can do. I certainly think there’s a future for smartphone-paired smartwatches but I think it’s far more likely that we’ll see more people wearing smartwatches as full replacements for smartphones in the next few years – there may be more people (think ‘casual’ consumers) that would be willing to sacrifice phone features for increased portability (comparable to how many consumers have stopped buying computers and are now just buying tablets). They’re not a waste of money but at this time a smartwatch is something I’d only recommend to another person if one has a need be aware of messages and calls or is simply just interested in technology and gadgets in general. Otherwise, wait a year or two and see what develops.